Archaeological excavations during 2013 at the monumental Sugarloaf Paleo-American encampment within the Connecticut River valley, central Massachusetts focused upon the “Ulrich Locus” –a manufacturing area of fluted points and bifacial knives. This ancient workshop is one of six at the Sugarloaf site, and it may have been used by knappers belonging to a single band of hunters. At the Ulrich Locus 115 stone tools (including 23 fluted points) were recovered along with 330 channel flakes and over 42,000 biface reduction flakes. Calcined bone from a hearth at this locus was radiocarbon-dated to circa. 12,350 calendar years before present (Gramly 2014). Only 30-35% of this rich archaeological deposit was excavated; much more awaits discovery. The Sugarloaf knappers routinely made three varieties of fluted points, (1) large lance tips, (2) small to medium-sized points suitable for tipping javelins, and (3) flaring-sided knives. This basal fragment (SLV-88) represents a fluted knife of the St. Louis style (Perino 1985) that failed during or after the second face was fluted. It was possible to reattach a collapsed channel flake (SLF-23 & SLV-99) to the first face that was fluted. Refitting of a channel flake to a fluted preform is rare. 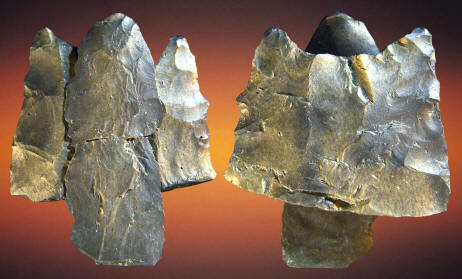 After breakage the fluted preform fragment was employed as a wedge (piece esquillee).